Have you started losing clumps of hair down the drain? If you spot strands of hair all over the floor and bunches of hair in your hairbrush you may wonder if your thinning hair will lead to baldness. And when you look online, there is a wealth of misleading information that can scare you silly. A lot of the info out there is fake news. If you want to know what’s fact and what’s fiction, you’re in for a treat. We’ve done all the research so you don’t have too. From not washing your hair with shampoo to tight ponytails, what’s true and what’s not? Are you ready? Let’s bust these myths! The age-old myth that only men suffer from baldness is totally fiction. Women actually make up 40% of hair loss sufferers in the US. Genetics play a big part. But for women, the cause of thinning hair and baldness is usually caused by an underlying medical condition. Seeing clumps of hair down the drain may cause you to panic. But a drain full of hair doesn’t mean you’re going bald. In fact, according to research, it’s normal to lose 50 to 100 strands of hair each day. If your hair is long, it may feel like you’re losing more. Losing this amount of hair is a natural process, and they will most likely grow back. With 100,000 hair follicles on your scalp, 100 strands won’t make a huge difference in your appearance. Thinning hair and a receding hairline are often associated with older women. Especially if they are going through menopause. 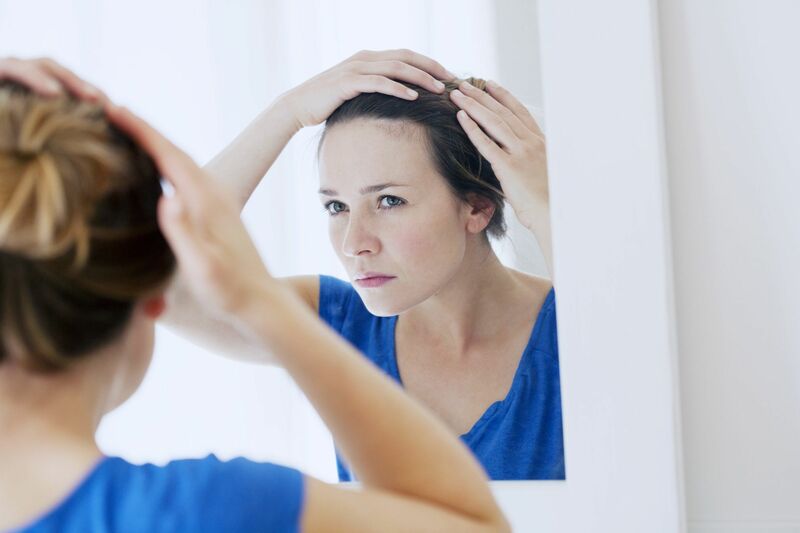 But female hair loss isn’t necessarily associated with age. Some women can start losing hair in their 20s or even in their teens. This often occurs if there is a family history or a hormone imbalance. As mentioned, several different factors can trigger thinning hair. It could be genetics, a hormonal imbalance, anemia, vitamin deficiencies, diet, weight loss or thyroid problems. It doesn’t matter if the hair is already fine or thick, any of these factors, and more may trigger hair loss. Having said that, thinning hair may be more noticeable in women with fine hair as bald patches may show up quicker. “Don’t use shampoo!” How many times have you heard this tale tail from celebs and bloggers? As much as this rumor is spreading, there is no evidence to back it up. Neglecting washing your hair can even have the opposite effect. Dirty hair can cause a buildup of dandruff or oil. Keep clean and shampoo as much as you want. Some anti-thinning hair shampoos are actually one of the best female hair loss treatments. There is also no evidence that other hair products cause thinning hair too. For instance, hairspray, gel, and mousse. Although if used excessively, they may lead to breakage. You must be careful when wearing your hair in a tight ponytail, braids or when wearing extensions. If you strain your hair to an extensive state, you will weaken your precious locks. These overly tight styles may lead to traction alopecia. Traction alopecia comes about because of environmental damage done to the hair. This may lead to a receding hairline and eventual baldness. Many older birth control pills contain androgen hormones that may cause thinning hair in some women. But most modern birth control pills don’t contain androgen hormones. In fact, some contraceptive pills can encourage hair growth and are used as female hair loss treatment. But if you are experiencing hair loss due to a hormonal imbalance from contraceptive pills, don’t worry. It’s reversible. You only have to change your prescription. The sun is not to blame! In fact, sunlight can help your hair to grow. Sunlight delivers Vitamin-D which is a skin and hair-boosting vitamin. Some use Vitamin-D tablets as a female hair loss treatment. If you’re not getting enough sun, make sure you’re getting your Vitamin-D through your diet. Not ALL hair loss is permanent. If factors, such as diet, over-styling, or other external factors are causing hair thinning, all you have to do is change your lifestyle. And some thinning hair issues may rectify themselves, such as hair loss after giving birth. But if it’s a medical condition or genetic, the results may be somewhat permanent. This traumatic situation can disrupt the cycle of hair which can make it shed quicker. But it is usually not permanent and will grow back once the stressful situation is over. Yet, minor everyday stresses will not make you go bald. For example, your hectic daily commute or having an argument with your partner. A lot like the abundance of fake news online, these myths can give you the heebie-jeebies. But it is clear to see that female hair loss isn’t what it’s made out to be. Now you know the fact from the fiction, what’s next? If you’re looking for the best female hair loss treatment, you’ve come to the right place. Check out our unique range of natural hair growth solution products that can help you go from bald to beautiful.